The team at our dental office in Woodway is committed to providing our neighbors with top-notch dental care so that each and every patient not only has a healthy smile, but a beautiful one too. However, there are some members of our community whose dental health is often overlooked…we’re talking about our beloved pets. And while we’re not currently accepting patients of the fuzzy kind, we still find it important to share some of the best ways to keep your pet’s mouth healthy. You make sure to brush your teeth twice a day, everyday as recommended by your dentist in Woodway. The same type of care is also important when it comes to the oral health of your pet. You can use a toothbrush designed just for your animal or simply a piece of gauze wrapped around your finger and some pet-friendly toothpaste. Never use a human toothpaste on an animal. Once you have all the necessary tools to brush your furry friend’s smile, the technique is very similar to brushing your own pearly whites. Hold the brush or your finger at a 45 degree angle and gently scrub in small circles. Pay attention to the side of the teeth that touch the cheek as that area often accumulates the most tartar. 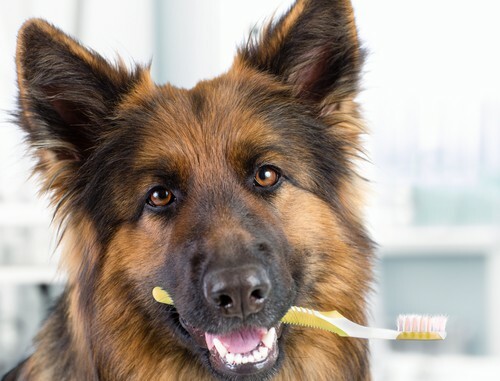 Brushing should occur two or three times a week for Fido, and twice a day for yourself. Just like eating tooth-healthy snacks such as apples or cheese can scrub away plaque on your teeth, providing your pet with toys or treats to chew on can do the same for theirs. However, your vet may recommend foregoing the typical hard bone and choosing a dental treat instead. Hard bones, while delicious for dogs, can cause tooth damage. You can also find tons of fun toys that help strengthen teeth and reduce plaque all while playing. If you notice any of these symptoms in your animal, schedule an appointment with your vet. But if you notice them in your own mouth, call your Woodway dentist. Has it been awhile since your last dental visit? Call our Woodway dental office. We’re always accepting new human patients and would happy to see you.